Researchers, students, and others who need to work with multiple PDF documents, are always on the lookout for ways to make this formidable task easier. PDF Stacks is yet another contestant in the world of PDF managers, trying to being order into the chaos of your PDF library. Unlike similar solutions such as ReadCube, Utopia Documents, or Zotero, PDF Stacks is a $39 program, and doesn't have a free option except for a 15-day trial. It would fit well into an office, but it's hard to justify paying good money if you're a starving student. Browsing your PDF collection becomes as easy as checking email. The world of PDF organizers is split in two: Tools that help you bring order to your existing PDF library, and tools that help you research what's available online and find relevant articles. While PDF Stacks tries to fit into both categories, in reality it only belongs in the first, with online research abilities that have nothing much to offer over your ordinary browser window. 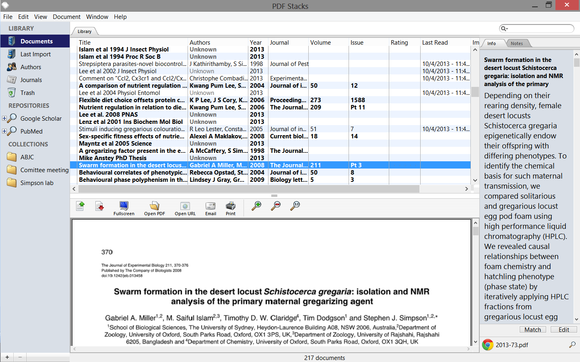 Upon launching the program for the first time, PDF Stacks will offer to scan your computer for PDFs. It will not, however, scan any connected external drives, or cloud storage folders such as Dropbox, so any PDFs stored there have to be added manually. Note that PDF Stacks creates an extra copy of any PDF you add to your library and stores it in its own, separate folder, so the more PDFs you add, the more space this folder is going to use. 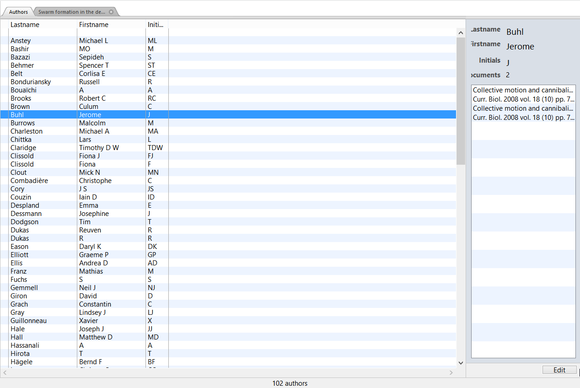 PD Stacks will now attempt to recognize your PDFs and fill in the title, author, year, journal, volume, and issue columns. If successful, it will also pull up an abstract to be displayed on the right sidebar along with the title. 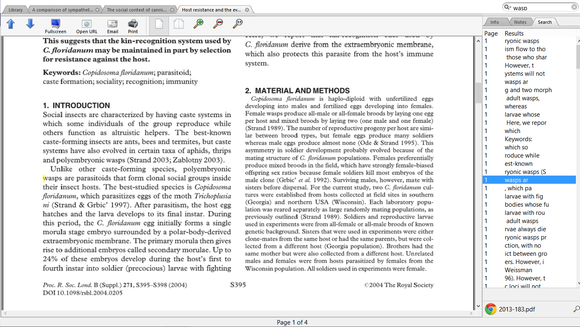 If PDF Stacks fails to recognize your article, which happened with approximately 80% of my PDFs, it will only display the file's name in the title field, but if you have the patience, you can search for each article in Google Scholar or PubMed, and use the program's "Match" feature to match your PDF with its online info. You can also edit these fields manually. Searching is instantaneous both in your library and in a single document. The program's interface resembles an email program, with a list of articles on top, a preview pane at the bottom, and a list of folders on the left. To manage large quantities of PDFs, you can create collections, which are very much like folders, and sort your documents into them by dragging and dropping, or through the menus. Very much like email, you can mark PDFs as read or unread, or flag them to make them stick out of the list. It's also easy to search through your collection: Simply start typing in the search box to find all relevant articles in your library. 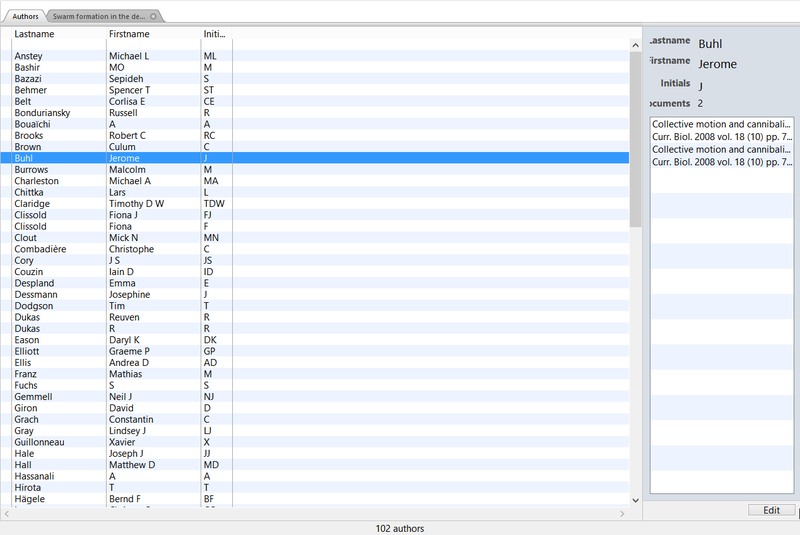 It's also possible to search for keywords only in titles, search for author names only, search for keywords in notes, etc. This is PDF Stack's strongest feature, making it possible to find specific articles or keywords with lightning speed. 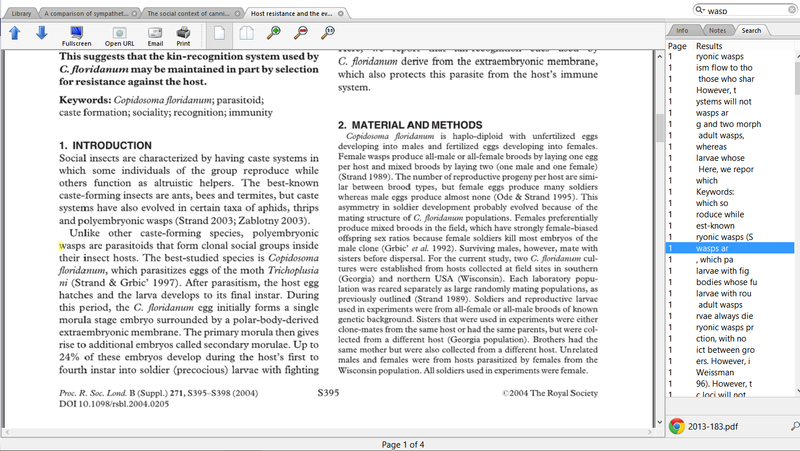 According to the product's website, PDF Stacks can also be used as a primary PDF reader. The preview pane is indeed a convenient way to browse through your documents, and when it's time to focus on one, the "Open PDF" button will open it in a new tab. You can also hit "Fullscreen" for a more distraction-free reading environment. Unfortunately, the reader doesn't come with any useful annotation or highlighting tools to speak of. The only note-taking method available is a semi-transparent notes window, where you can jot down your general thoughts. There's no way to attach notes to a specific line, or to highlight parts of the article for any purpose. Any notes you make will appear in the right sidebar when browsing your files, and as mentioned earlier, you can easily search through them. 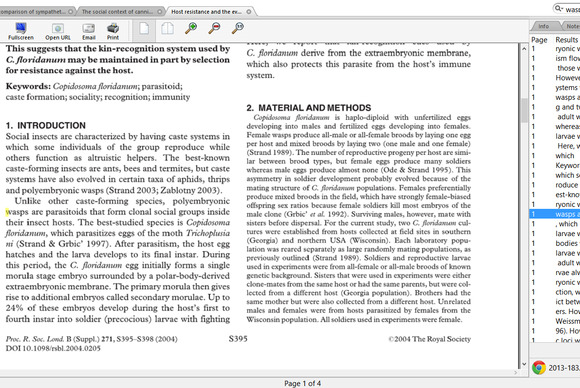 Browse your PDF collection by author or journal. The PDF reader offers three other important options: Open URL, Email and Print. The Print and Open URL buttons worked as expected, although the Open URL feature wasn't available for most of my articles, but the Email option requires an installed email program in order to work, and Windows 8's Mail is not considered to be one. Being a Gmail Web user, I couldn't use this feature. A look at the program's left sidebar reveals several useful categories. The authors category includes an alphabetized list of all the authors PDF Stacks has recognize from your articles. Clicking on an author reveals a list of every article by this author that resides in your library. There's a similar list for journals. Here you'll also find the Google Scholar and PubMed searches, where you can search for articles from within PDF Stacks. When you find an article you're interested in, you can import it into your library, but note that at this time it will only import the article's information, not a PDF. If you have a matching PDF, if you can attach it through the menus. PDF Stacks's interface makes it easy to browse through piles of PDFs without losing your way. There are some confusing aspects to the interface, however, and important options have the tendency to hide where you least expect them. Once you get over this hump, however, the program becomes fairly easy to use. PDF Stacks is a solid PDF organizer, and may be a good fit for professionals trying to swim through a sea of documents. If you're a researcher or a student, however, free options such as ReadCube offer superior features at a superior price. PDF Stacks is a solid organizer for businesses, but not for academic research purposes.